The best friends and I had been talking about going on a trip together since 4 years ago but procrastination got the better of us. We never got round to committing ourselves till a few months back. Since it was winter season we figured travelling on our own would be too difficult. Being a group of three girls, the parents weren’t exactly willing to give their blessings either. Thus in the end (despite many friends persuading us otherwise) we opted to go on a tour package to Korea. Travelling with friends is really fun, an entirely different experience vis-a- vis travelling with the parents. We were brimming with energy the day we landed in Seoul, so much so we were actually game to shop through the night that day if not for the fact that our hotel wasn’t located near any shopping areas. In fact we still explored the neighbourhood that night because we were so curious about our surroundings. I don’t have any siblings so the parents never allowed me on roller coasters when we go to theme parks. But with the friends we headed straight on to the scariest rides Lotte and Everland had to offer. Hiking up the hills involved running, and throughout the trip camwhoring was the order of the day. Whenever we were in the airport, or in our hotel the first thing we would check is if there was free wifi. Free wifi meant whatsapping to our hearts content, and facetiming with our parents! But I think the biggest adventure was right at the end, when we didn’t have enough money to pay for our tips. Our guides paid for some of our meals (we ate without realising oops) so we spent more than we should. Thankfully we were staying in Hilton which had a money changer downstairs. Guess how much money we had to change? 40 Sing dollars. The parents couldn’t stop laughing at me. But the story did not end there! the next day we had to buy photos, but we were penniless by then. Our photographer was a really nice person, and the photos were really good. Fortunately we got to know two families pretty well during the trip so one of them helped us pay first. It was a funny experience, being bankrupt on the last day and going home in debt. But on a more serious note it really made us appreciate the presence of adults! I won’t be writing about my entire trip of course, it’ll most certainly bore you if I launch into every single activity we did. Instead I’ll write about my favourite places, and occasionally some posts about the fantastic food we had that kept us so energetic throughout the trip. 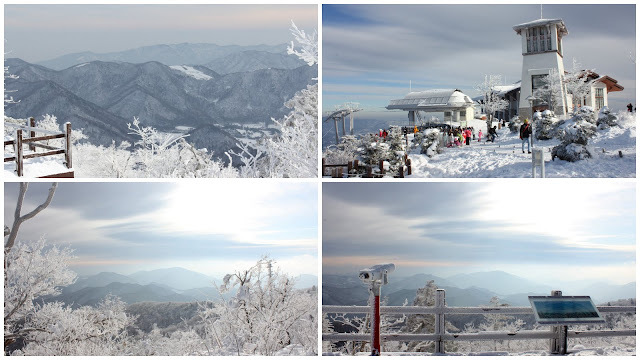 Yongpyong Ski Resort is located in Daegwallyeong-myeon (대관령면), in the northeastern part of South Korea. We stopped by a traditional Korean restaurant for dinner en route to our destination from Busan. One of the local staples there during winter is Dried Pollock (or Huang Tai Yu in Chinese). We saw some being cured outside the provision shop next to our dinner place. 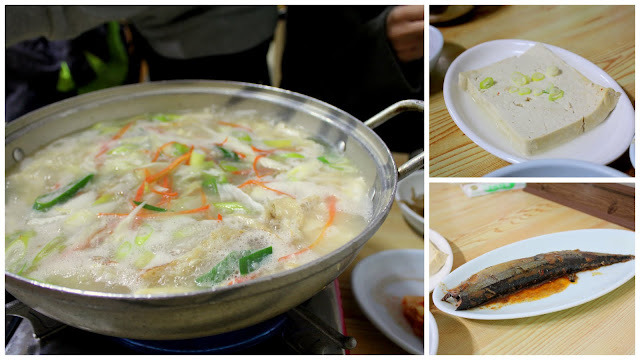 We had a wholesome meal of Dried Pollock Soup (북어국, Bugeoguk) and a wide array of banchan. Dried Pollock soup isn’t everyone’s cup of tea I realise. But for myself, having grown up with soups boiled with dried ingredients like scallops and fish, this soup really reminded me of home. The pieces of tender tofu and the cracked egg made it even better. Comfort food on a cold winter day! That night we skied at the resort, and had ice cream from the minimart for supper. All korean store-bought ice creams are cheap and good. There is a dizzying variety of flavours like walnut, pistachio, blueberry, red bean, and chocolate. Had ice cream almost every night! The next morning we took a Gondola up to the highest point of the resort, Dragon Peak. 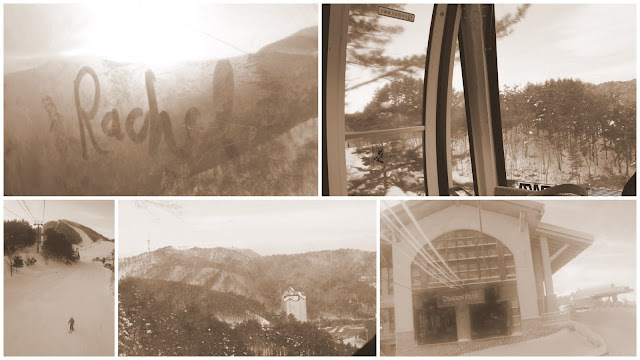 We were all amazed by the stunning views of the resort on our way up. Some parts were really steep but no worries, the gondola kept at a slow continuous pace for the entire 25 minute (I think?) ride. The view was even more spectacular right at the top. 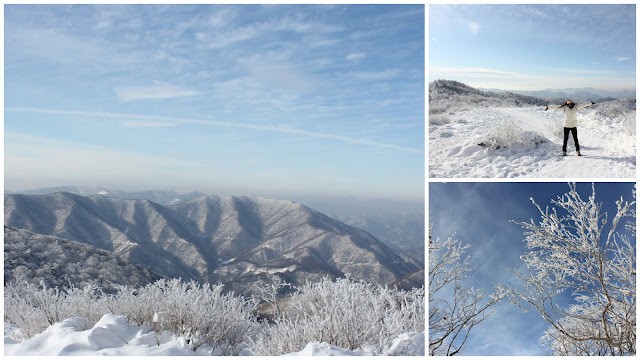 Yongpyong Ski resort is nestled at the center of Korea’s Baekdudaegan Mountains. It was as if the scene was frozen in time as everything was frosted white and so still. All we felt were the biting winter breeze whipping our faces and a deep sense of awe. Feeling adventurous we trekked out a little further to less trodden land. We were greeted by an empty clearing covered by a thick blanket of powdery snow, with not a single soul in sight. The serenity coupled with the azure blue sky and the magnificence of the mountains kept us in silence for awhile… before we started goofing around with the snow! Snow was deep enough for a snow angel to be made!